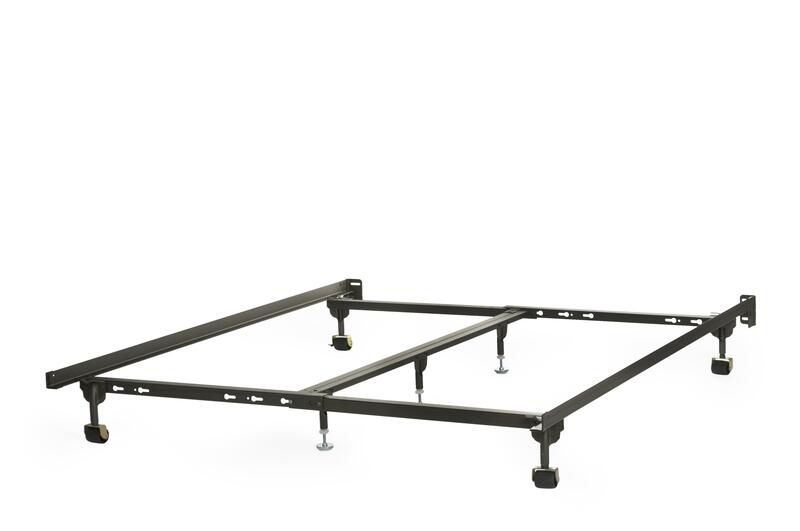 This 7 leg Universal Deluxe frame adjusts to fit a Twin, Full, Queen or King Mattress set. The extra wide rug rollers make it easy to move your frame across carpet or hard floors. With heavy duty headboard brackets it will accommodate most headboards. The Iron Horse Deluxe Rug Roller 7 Leg Universal T/F/Q/K Deluxe Rug Roller Frame by Glideaway at Miskelly Furniture in the Jackson, Pearl, Madison, Ridgeland, Flowood Mississippi area. Product availability may vary. Contact us for the most current availability on this product. The Iron Horse® Bed Frame with Deluxe Rug Rollers Collection from Glideaway features 2 1\2" wide rug roller's for easy, safe movement over carpet or hard floor surfaces. Each frame is designed with 1 1\2" x 1 1\2" steel side rails and cross arms. Heavy Duty Headboard Brackets provide improved strength and accommodate more headboard widths than standard brackets. Available in a 4 leg Twin / Full, a 6 leg Queen, a 7 leg Queen, a 6 leg King, a 6 leg Cal King and a 7 leg Universal Twin / Full / Queen / King size frame. Lifetime Limited Warranty. The Iron Horse Deluxe Rug Roller collection is a great option if you are looking for Mattresses in the Jackson, Pearl, Madison, Ridgeland, Flowood Mississippi area.